A really good bag design from Boulder. The logo is not overly dominant as it was on their previous packaging. The vinegar add the flavor necessities. The positives, like All Natural, Gluten Free etc are visible at the top. The only criticism is the brilliantly bright red bag is virtually the same color as the Hickory Barbeque. When going for color coding with your design flavors, you need different colors! As they are Kettle Cooked they were thicker than regular Chips, but these did not appear crunchier because of that extra thickness. If anything it was more of a crisp snap. There was some browning on some Chips but no red flavoring seasoning that we came across. They were pretty greasy and had lots of flaky bits. The potato skin on many of the Chips edges was a welcome sight. Prior to the recent re-branding and packaging process, Boulder Canyon had a Balsamic Vinegar flavor. This Red Wine Vinegar variant appears to have replaced it. 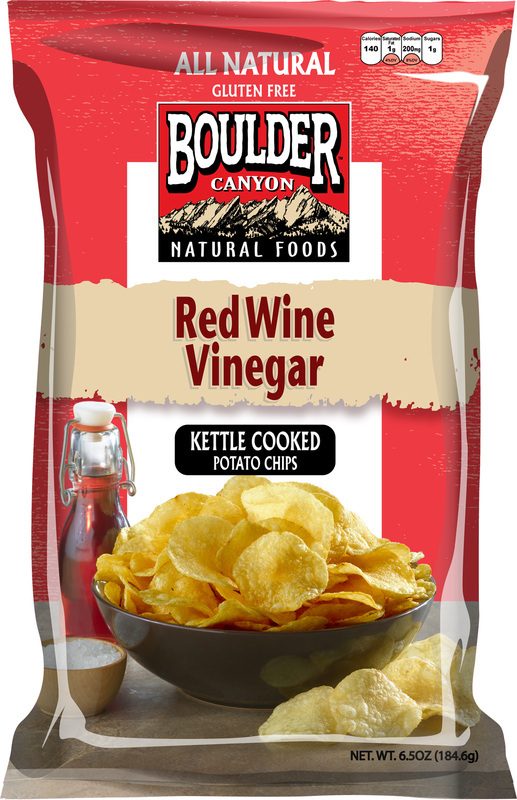 On the reverse of the pack it does not mention Red Wine Vinegar as an ingredient. It does however say that it includes Balsamic Vinegar. A cynic would suggest that this is exactly the same flavor but with a different name! Whatever, the taste was a bit bland. We would suggest the Malt Vinegar and Sea Salt if you are looking for a vinegary flavor. These had a slight sweet taste, but not much.